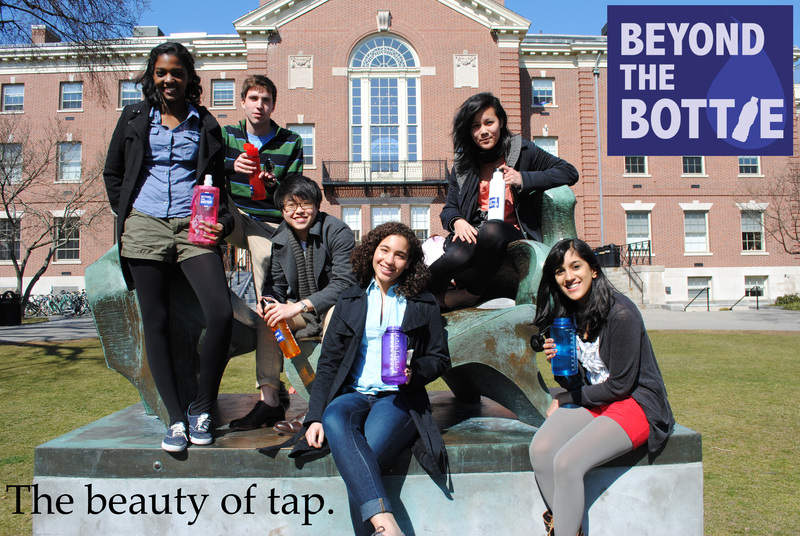 “Beyond the Bottle” is a Brown campus campaign organized by Empower, an awareness group at Brown. The objective of this campaign is to encourage Brown students to reduce the use of bottled water through the use of tap and reusable water bottles. This entry was posted in Competitions and Awards and tagged Brown University, Environment, Sustainability, Tap water, Water bottles. Bookmark the permalink. ← Green Argument – Practicability and Future of Solar Parabolic Cookers (SK-14) in Nepal – Why Should Nepalese Government Introduce SK-14 to the Community. I am very impressed. I would like to tell you about another example of reduction of plastic bottles that is good. At Chicago’s O’Hare airport, there are several small wall kiosks, each equipped to dispense filtered drinking water for free. You have to supply your own bottle. I always carry a re-usable bottle. The security line does not allow any water anyway. So, once across security, instead of buying water, most simply refill. The kiosks are conveniently located. I hope your group can create some kind of award or another creative idea to bring attention to the Chicago airport filtered-water kiosks and encourage public areas to like railway stations and long stretches of roads or post offices etc to have this. On Earth day it was good to read about your group. Stay motivated and keep inspiring others. Do not give up. Thanks for the comment. We will definitely try our best to spread such initiative around our campus. I believe the biggest obstacle for a lot of traveling people to use reusable water bottles and refill is that people usually want to travel light and they usually do not have much room left for a reusable water bottle. So they would rather buy water when they need it and throw it away once they finish the bottle. This thinking sometimes came across my mind as well. But we should definitely work on changing people’s mindset. One of the thing Brown does is that we do not sell any bottled water and it has been working well so far. Also, we have just installed some new water refilling machine which have a counter showing us how many plastic water bottles we have save. I personally love this gadget because the number shown encourages me not to use disposable water bottle and also allowing me to have a concrete idea of how many disposable water bottle we are all actually saving. I just visited your blog, and I like it a lot. Keep it up of spreading the nature pursuing message as well and happy Earth day. Thank you, for visiting. I want to emphasize the importance of readily available filtered water. There are many contaminants in tap water. A common one is birth control pill’s estrogen. Many women flush their unused pills and they end up through the towns water recycling process in our tap water. We do not know the long-term effects of human introduced contaminants in our tap water. The authorities do their best to remove them but there are tests available only for a few. Only New York City removes 99 items but 2000 are still there, remaining to be removed and/or tested. Other states tap water falls behind New York city. Bottled water sources are often tap water. So, encouraging readily available filtered water supply may be good for a larger society. Keep health bills down for a community perhaps.